To celebrate our 2nd release of Cherry Red switch Filco keyboards after the initial launch back in March 2011, we’ll be stocking a limited edition Red on Red model. These new keyboards feature a beautiful Italian red chassis to match the Cherry MX red mechanical switches at their heart. Red switches are the newest switches to be added to the Majestouch line and have proved quite popular since their introduction. The switch is characterised by an extremely light touch – just 45 cN is required to actuate them. They are a linear switch, like the older Cherry MX Black, forgoing the tactile bump or audible click that you’ll find in a board using Cherry MX Brown or Blue switches. This makes them quieter than their fellows, and therefore more suitable for a crowded office environment. Whether you’re using a red switch keyboard for typing or gaming, you’ll be satisfied. The low actuation force of these switches makes typing particularly effort-free, although some users may miss the more readily apparent feedback provided by a Brown or Blue switch. 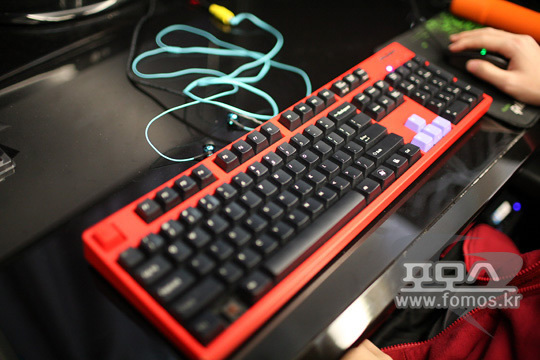 The red switches have also proved popular in the gaming space, particularly for FPS players as the light linear switches are easy to double-tap on and generally rapid to use. Of course, everyone has different tastes, but a Cherry Red switch is well worth trying out if you haven’t already. Filco Majestouch-2 keyboards are the gold standard of mechanical keyboards, so whether this is your first mechanical or your fifth we hope you’ll have a look at these gorgeous Red on Red models. For more information and photographs of these keyboards, please visit the official Keyboard Company product page via the links below. Thanks for visiting our blog once more, and please do leave your comments below if you have a few moments. I’m always happy to answer any questions or respond to any feedback you might have, whether it’s via those comments, on Twitter @keyboardco or on the KeyboardCo page on Facebook. Have a great day! ‹ New Matias keyboards announced at CES, coming soon to Keyboard Co!